Sweet mangoes, spicy peppers and fresh lime combine to make this Slow Cooker Thai Mango Chicken a family favourite. Paleo and gluten-free. My Mango Chicken has been one of my go-to chicken dinners for a long time. Recently, a reader asked if she could make this recipe in a crock pot or slow cooker. What a great idea! Why didn’t I think of that? I’m always on the lookout for quick and easy dinners and this one certainly meets that criteria. After her suggestion, I got busy and adapted my original recipe to streamline it and make it gluten-free and paleo. This time, I used frozen mango chunks because they were less expensive than buying fresh mangoes. I also used boneless, skinless chicken thighs instead of breasts, but either will work just fine. I cut out the oil and flour by removing the need to brown the chicken parts first. 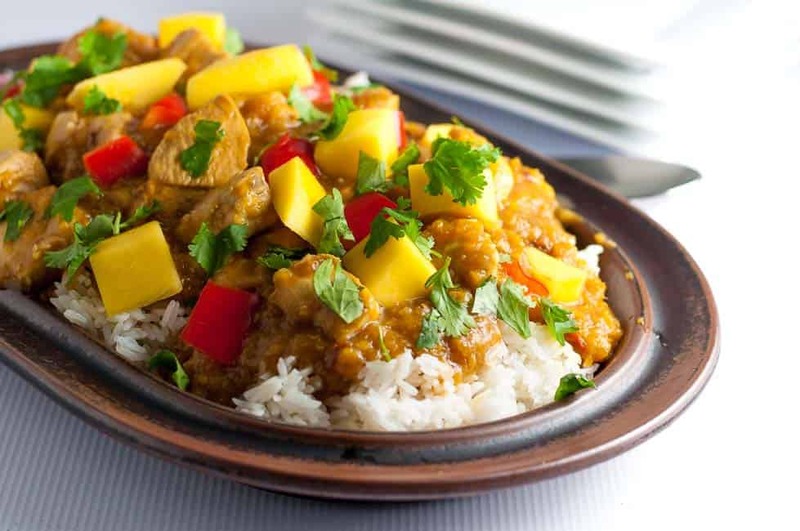 This Slow Cooker Thai Mango Chicken will keep everyone happy! This easy chicken dish is cooked with a flavourful Thai-inspired sauce made with chili peppers, lime, ginger and turmeric. One of the best parts about it is that you can increase or decrease the amount of heat. Leave out the Thai chili peppers, or add more! Increase or decrease the amount of ginger you add. You know your family’s tastes. Just adjust the seasonings to keep everyone happy. 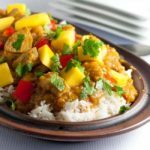 Cook this Thai Mango Chicken in an Instant Pot! This one-pot chicken dish is just so simple and it cooks beautifully in an Instant Pot too. Process all the sauce ingredients in a food processor, put the chicken in an Instant Pot, pour the sauce on top and let it cook. 10 minutes should do the trick! Garnish with some red pepper, cilantro and the remaining mango chunks. 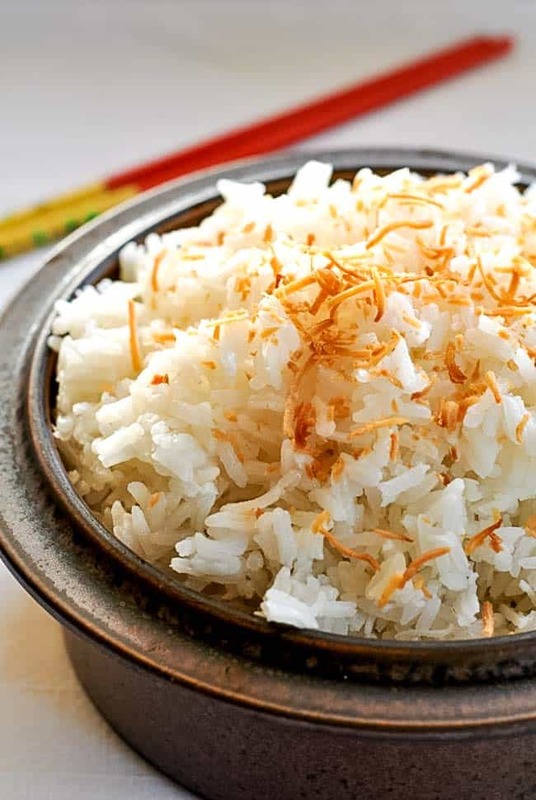 Serve over your favourite rice or this yummy Thai Coconut Rice–the one that hasn’t failed me yet! All the tastes of Thai food in one easy-to-make crockpot dish. 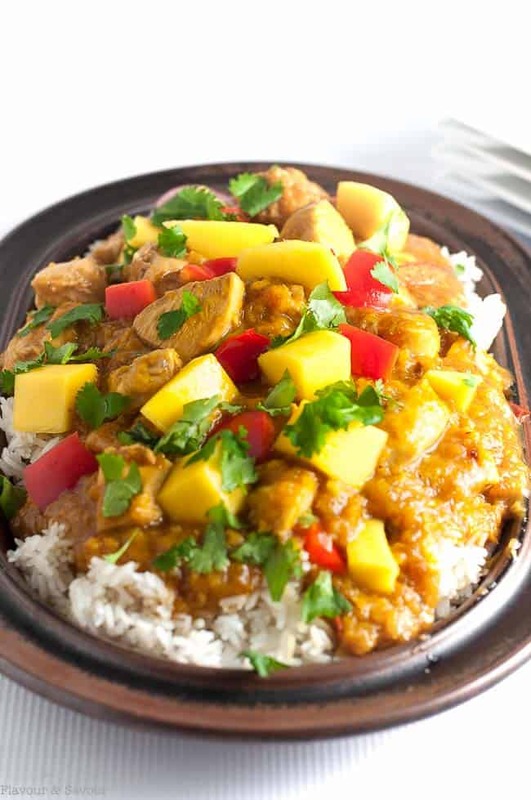 This Slow Cooker Thai Mango Chicken recipe makes an easy weeknight meal. Place all Mango Sauce ingredients in a food processor. Process until almost smooth, leaving a few chunks. Transfer to a serving dish. 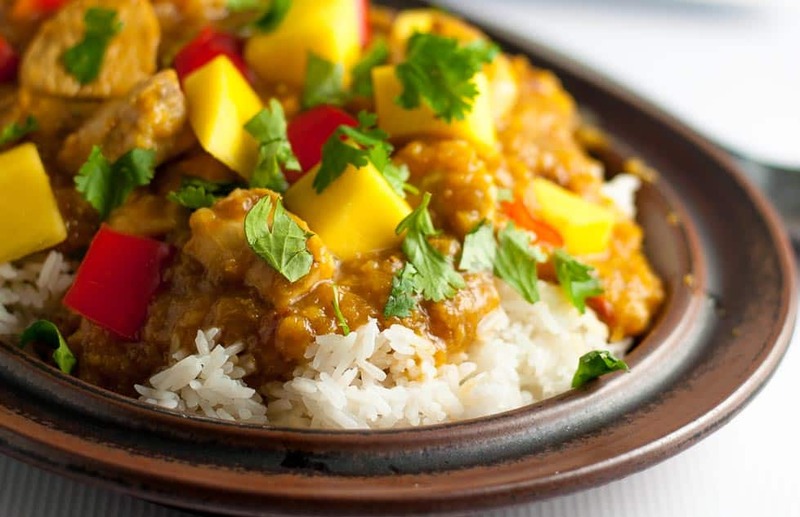 Sprinkle with fresh cilantro, diced red pepper and mango chunks and serve with Thai Coconut Rice. Cooked in coconut milk, this recipe has never failed me. No more sticky rice! Love Thai flavours? Try this popular recipe, too. It’s a meal you can make ahead of time and store in the freezer for a buy weeknight. Flavoured with cilantro, ginger, basil, garlic, jalapeño and coriander, it’s a slightly spicy dish that leaves you wanting more. I’ve just made this dish for a small dinner party and everyone loved it! Can I freeze the left over chicken with mango sauce for another time? Or will the chicken be tough? Hi Margo, I’m so glad that you and your guests loved it! It’s one of my favourites, too. Yes, freezing the leftover chicken and sauce should be just fine! Oh I love the sound of this! I am getting hooked on mango recently and already love Thai/Asian food. I’ll have to try this soon! Thanks for sharing! This is one of my most popular recipes, so I hope you like it too! Thanks for commenting. Oh MY GOSH! I DID IT!! 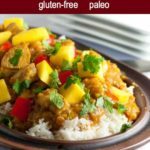 Chicken Mango is my absolute favorite dish, (even though I only made it using Gluten Free Microwavables,) and I made it on my own with this great recipe!! Thank you so much for publishing it. I sometimes have issues cooking and this is the BOMB! You just made my day! So happy you liked this recipe and that it was easy for you! Thanks for letting me know. 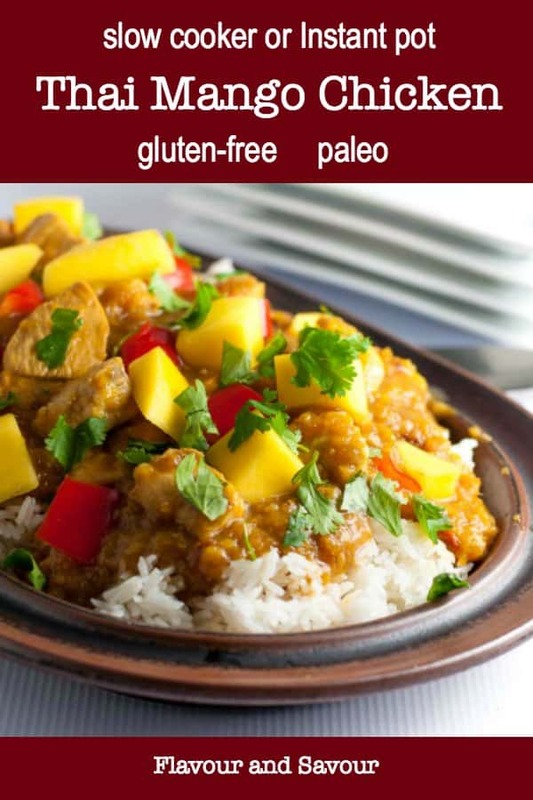 I had a box of mangoes and was looking for alternate ways to use them, so I made this for dinner last night and it was delicious!! The flavours were amazing and it was so easy. I will definitely be making it again. Hi Sal, Thanks for letting me know how much you like it! I just made this recipe last night too! I appreciate your comment! For instapot do you let pressure come down manually? I usually use natural release for about 10 minutes. Thanks for your question, Julie! Hope you love this recipe as much as we do. Can I cook this in an oven by browning the chicken first? Sure! 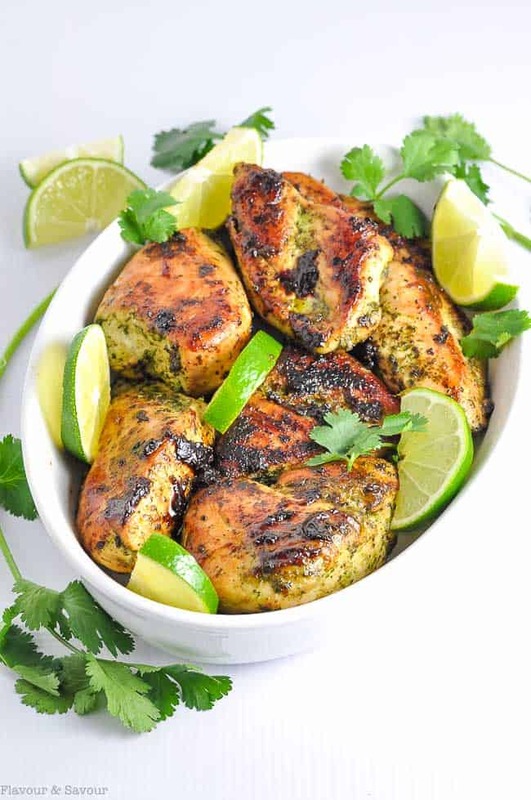 Or you could use my easy stove-top recipe for Mango Chicken here=> https://www.flavourandsavour.com/mango-chicken/ I’m sure you’ll love it. Let me know how it turns out!